NetMarketShare's statistics for December 2013 reveal that Windows 8.x made steady progress in the final month of 2013. 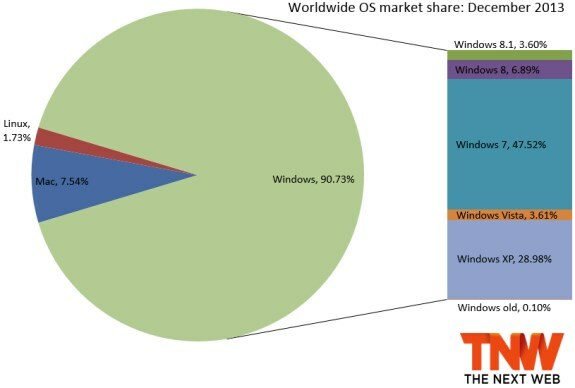 The operating system's marketshare rose from 9.30 percent in November to 10.49 percent in December. Windows 7 is also still growing, it now stands at 47.52 percent, a gain of 0.88 percent versus the month before. The biggest mover in the rankings was Windows XP, it fell 2.24 percent to 28.98 percent. In 2013, Windows lost share every month except for March, July, and November. In December, Windows slipped 0.15 percentage points (from 90.88 percent to 90.73 percent). OS X dipped 0.02 percentage points (to 7.54 percent), while Linux gained 0.17 percentage points (to 1.73 percent).